For my 21st birthday, I wanted to try a new restaurant in Portland. Unfortunately, I would have to wait many, many years for that special birthday treat, but this year I got to do it. I suggested some places I had never been to and my wife decided we would go to a place she wanted to try. Marriage – it’s a compromise. I give my opinion and then I comprise. We (she) decided on JP’s Bistro, a three year old Italian restaurant on Woodford St in the Rosemont neighborhood area. I didn’t know much about JP’s, but when we made reservations, they only had 8:00 available which I took as a good sign. We showed up at 7:45 to a restaurant that was packed both inside and out. I didn’t immediately see anyone who looked like they worked there until I saw someone rushing around who eventually asked us if we had reservations. We said we did and he led us to the only open table in the small restaurant, leaving us with menus to peruse. It didn’t take long for someone to visit our table. When he walked over though, I once again questioned if he worked there. Then I realized why I couldn’t grasp who were the employees at the restaurant. They didn’t have work shirts or uniforms. While having a uniform for restaurant employees doesn’t necessarily change the quality of the service or food, I definitely recommend them. Most restaurants have them and there’s a reason for it. It helps customers immediately recognize the staff and gives a sense of unified service to both the employee and patrons. Our waiter greeted us, introducing himself and promising water in short order. A little while later, he came back with a pitcher and filled our glasses. Over the course of the waiter’s next four visits to our table, we were brought bread and butter, gave our drink order – just wine for my wife, received our drink order, and were explained how the specials worked. The butter provided with the bread had fresh herbs which I use to cook on a regular basis, but I was too sober to pinpoint exactly what they were. The specials were all on a blackboard above us. They actually have a larger special menu than regular menu with 18 or so entrees, three apps, and two soups on the special board alone. The next return to our table gave us an opportunity to ask questions about the menu which was good because there were some items I’d never heard of. I was absolutely shocked at the aptitude the staff displayed with the descriptions of the food and drink. Not only did I hear it from our waiter but from the other wait staff for tables near us. They explained the ingredients, cooking techniques, and even how the flavors blended together and their personal favorites. They had a knowledge of the food that was at least at the level of someone that was actually cooking it. I was impressed. In case the food specials weren’t enough, they had many drink specials that they knew just as well. After the display of food-description wizardry, we were ready to order apps. She ordered a Caesar Salad – no anchovies – and I ordered the Crab Stuffed Mushrooms – a special and one of my favorites since the days I made them as a cook in Southwest Harbor. We were still deciding on our entrees, so with another return to our table a bit later, we ordered. The waiter’s description of the Chicken Constantine caused that to be my top choice and she went with the Parmesan Crusted Haddock after getting that as a recommendation over the Pan-Seared Scallops. In case it’s not obvious yet, there were a lot of back and forth trips to our table and the progression of our meal from entrance to first orders arriving was taking quite a bit longer than I would want it to. However, there were a couple things working in the restaurant’s favor. The first was that, upon arrival, I suddenly started to not feel so well. That certainly reduced my need for immediate food. The other more important factor was that we were receiving regular visits to our table even though they were spaced a bit far apart. It didn’t hurt the other wait staff were helping us on occasion by delivering water refills and such. It probably wouldn’t have been bad if someone kept us updated on where our food was, but we didn’t ask as we could see they were ridiculously busy and the staff was working hard. When our apps finally arrived, it was 8:55. It was a bit of an excessive wait, but the first bite of my mushrooms turned out to be exactly what I was looking for. The mushrooms tasted fresh and the crab stuffing had plenty of crab. They were topped with Swiss cheese which makes practically everything better. The chef definitely knew his stuffed mushrooms. The bottom of the dish had a little pool of butter which gave the mushrooms a bit of an “I might have a heart attack when eating this, but it’s unlikely” taste. The Caesar showed up with the anchovies on it. It didn’t stop my wife. She placed the disgusting, salty swimmers on her bread plate and enjoyed the salad. There was quite a wait after we were done the apps. I was surprised that no one really seemed to be too upset with the delay. It appeared to be a popular neighborhood joint, so I considered that a lot of people might be regulars and at least a few did seem to know some of the staff. But I’m sure that wasn’t the case with everyone. I guess the customers saw that staff were busy and working hard. At some point, the waiter came up to my wife and said he took the liberty of changing her order to the Pan-Seared Scallops since they 86’ed the haddock. She was slightly disappointed since the waiter talked up the parmesan crust so heavily, but scallops would have to do. With more waiting, we got to observe more of our surroundings. At one point, after the sun set completely, it became very dark in the restaurant. A light in a hutch, which appeared to block the view of bathroom doors, was turned on and gave a perfect amount of additional light. Some time later, someone turned on more lights which made the room too bright. Then the people who came in before us started getting their food, so we knew ours was close. We had verification when we were told as much. Entrees finally arrived at 9:45. The chicken came topped with prosciutto, red peppers, mushrooms, and parmesan. I ordered the garlic mashed with it and there was also a vegetable medley. The scallops came with asparagus and a mushroom and onion risotto. My food was excellent, though for my money, I thought the addition of prosciutto made it a bit heavy. The flavor was delicious though and if I was feeling better I might not have even cared. The sides were very good too. The scallops were cooked perfectly and though I didn’t try my wife’s risotto, she liked it. I probably would have eaten all my food had I felt better but there was indeed food left on our plates when we finished. We had no room for dessert. It was 10:00 which was their closing time, but I’m pretty sure the kitchen was still running hard. Our waiter did apologize for the wait, thanked us for our patience, and made it clear that normally the wait isn’t that long but that they were extremely busy on that night. In the end, the meal came to $80 with tip. Thanks to my wife, it didn’t cost me anything. JP’s Bistro clearly has a following. There’s no doubt they are doing something right. 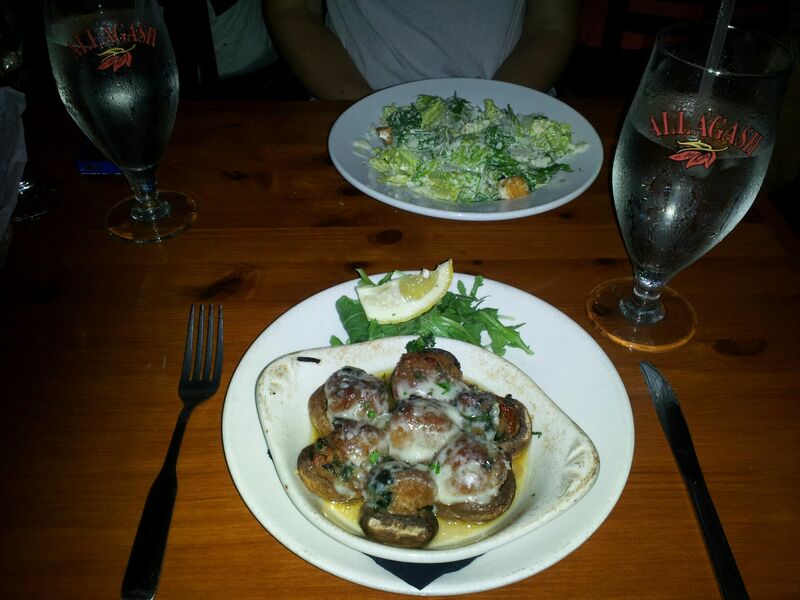 The food was very good and my app was among the best stuffed mushrooms I have ever had. The wait staff was extraordinarily well-versed on the menu. They worked together better than the staff at most restaurants, helping each other when necessary and never seeming rushed at our table even though they were very busy. But there were some mistakes made on the night we were there. The biggest mistake was obviously the delayed food. I’m not sure what the issue was. Maybe someone called in sick, maybe they under-scheduled, or maybe the kitchen was just off that night. It’s something to be aware of as repeated instances would definitely cause customers to go elsewhere. The other issues were minor, though staff shirts are a very good idea and JP should provide snazzy new outfits for his staff. It adds to the professionalism. Would I return? Yeah, I’d probably give JP’s another shot in the future. They got enough right with the staff – which they are very lucky to have – and the food to warrant another chance. But I will remember what the waiter said and regardless of how busy it is, I will expect that my first visit was the exception and that my food will be delivered promptly. Two hours is simply too long for a meal with only apps, entrees, and a glass of wine, but it wasn’t all bad. This entry was posted in Portland, ME food on July 4, 2013 by peterpeterportlandeater.